The level design stays the same, but after the first few waves you will see the bridges at the bottom of the screen burn away. A small flame will also appear above each lava pit. Hover over this flame and a hand will grab you and drag you to your death unless you button mash to freedom. The good news this also affects enemies on screen. There are three variations of rider, and if you take your sweet time to finish the wave the “unbeatable” pterodactyl (as quoted by the game itself), will appear and hunt you down. The only way to defeat this monster is get your javelin pixel-perfect into the mouth when its open. It takes some serious Joust skills to do this, but when you get it down it is one of the most rewarding feelings in the arcades. That and you get 1000 points. The game becomes very interesting if you throw a second player into the works. Joust features 2-player co-op and competitive play simultaneously, which was quite a unique concept. Generally speaking you are supposed to work together but you can always choose to take out your teammate. After all, this is a score based game and playing dirty with the other player will determine who comes out on top, just don’t expect to get very far in the game. It isn’t uncommon for deaths to happen accidentally since Joust becomes very hectic with several enemies on screen at once in the later levels. Accidental deaths are likely to happen even with the most loyal of co-op players. The sounds used in Joust create some memorable moments. You have a charging sound as you spawn from a platform after loosing a life, which almost sounds like a pixel motorcycle. There’s also the unique brake sound effect as your ostrich comes to a abrupt halt. What will haunt your dreams the most is the scream from the pterodactyl when it appears and stalks you. Joust is a thrilling arcade game. As I prepared for this review, it really hit home the excitement of arcade games. Examples include making every life count and feeling devastated at loss, but also humoured as you watch your riderless ostrich fly away. The thrill of hearing the extra life music when you gain 20,000 points or discovering new techniques – like sitting on a spawn pad to prevent enemies from appearing – are all part of the draw. The best moment of Joust is after several restarts when it finally clicks and you are flapping through the waves with all your lives intact until you hit another wall. You are defeated again, but you learn and do better next time. Almost seems there is a hidden life lesson here. For the early 80s Joust certainly was different from the plethora of space adventures in the arcades. Even today, how many video games feature an Ostrich you can ride? Seriously, I’m drawing a blank on this one. A fun arcade title alone or with a friend, Joust is an arcade game that reminds us simple designs can certainly stand the test of time. 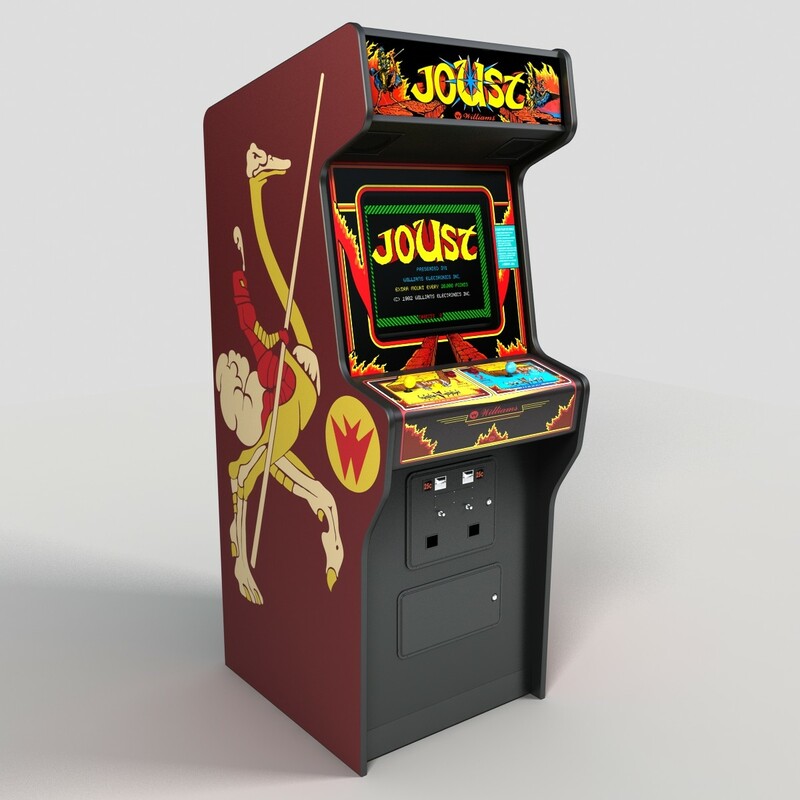 Joust can be found in many home consoles. 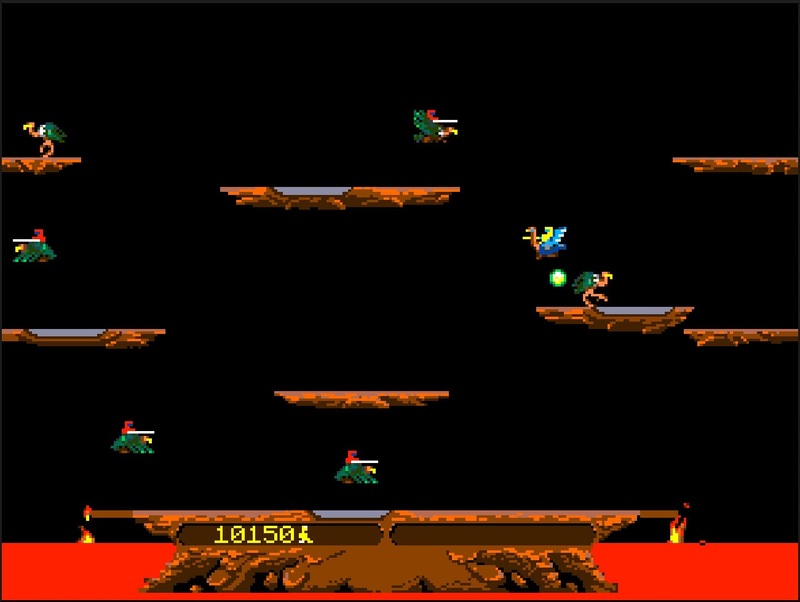 Outside of arcade emulation in MAME, it has ports on the Apple II, Atari 2600, Atari 5200, Atari 7800, Atari 400/800 (microcomputer), Atari Lynx, Atari ST, IBM (Compatible) PC, MS-DOS, Macintosh, and NES (programmed by Satoru Iwata himself) and more recently as standalone titles on Xbox Live and Playstation Network. Those who want it as part of a collection can check out 1996’s Williams Arcade Greatest Hits on various platforms, 2000’s Midway’s Greatest Arcade Hits on Dramcast, Nintendo 64, and Gameboy Advance, as well as 2003’s Midway Arcade Treasures on PS2, Xbox, Gamecube, and PC. There was a 1995 Arcade Classic 4 for the Gameboy that featured this title and 2005’s Midway Arcade Treasures: Extended Play for the PSP. Finally the Midway Arcade Origins collection from 2012 is available as a downloadable massive pack for Xbox 360 (and backward compatible with Xbox One) and Playstation 3. 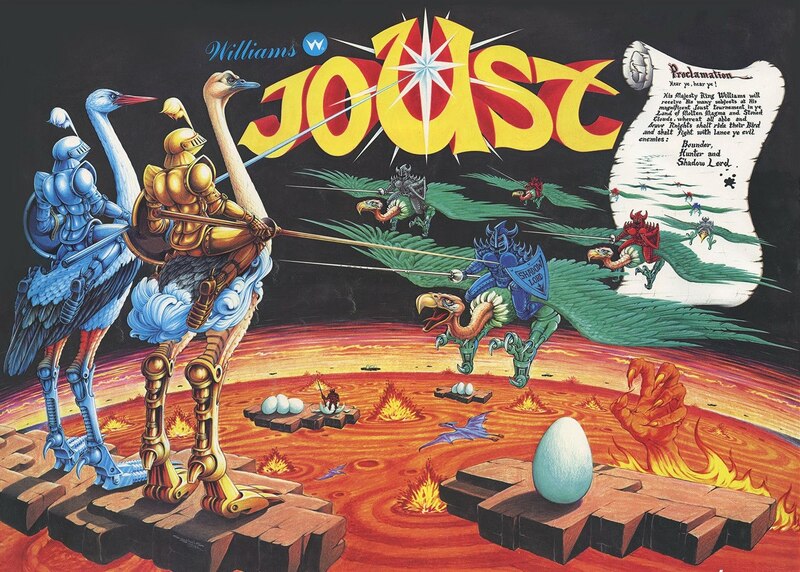 In short, you can find Joust on just about every console/computer in history.